1. Clean fish well in salted water and slice. 2. Grind chilli powder, pepper powder, mustard seeds, button onions, garlic cloves and ginger to a fine paste. 4. Rub the fish well with the paste. 5. Keep covered in a cool place for some time. 6. In a heavy skillet, add oil and deep fry the fish on both sides, turning gently to ensure even cooking. 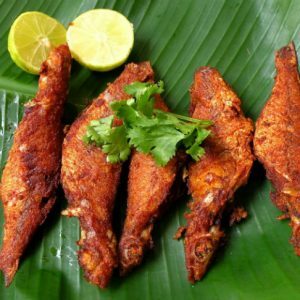 Feel free to comment or share your thoughts on this Fried Fish Recipe from Awesome Cuisine.